Disclaimer: I was a guest at the relaunch party. Visit thetaxpayer.com.au for details of the drinks and food menus. The Taxpayer has been nestled in Victoria Square for about a year now and its location makes it ideally positioned to take advantage of a very generous footpath dining (or drinking) area and views across the square. 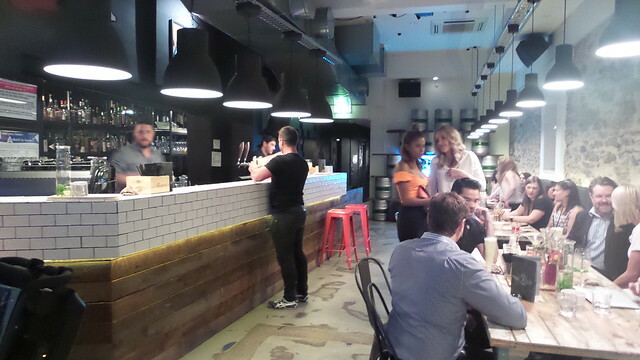 Just in time for summer it’s had a quick makeover and a revamp of its food and drink offerings and so, morphed itself into The Taxpayer Burger and Booze Bar. It was quite appropriate that the re-launch party was held on a suitably summery evening and the Adelaide A listers* were out in force. And The Taxpayer stepped up to the mark, showcasing an impressive selection from its cocktail menu. The cocktails certainly excited some discussion and the stand out (both in terms of looks and the number of people going slightly mad for it) was definitely The Godfather. We were also able to sample the new menu – including the Al Capone burger which is reputed to be Adelaide’s best (I really DON’T want to enter that kind of debate!). The burgers were good – although I do think that the Al Capone could be improved by using standard caramelised onions rather than a caramelised onion jam because for me it was a touch sweet. 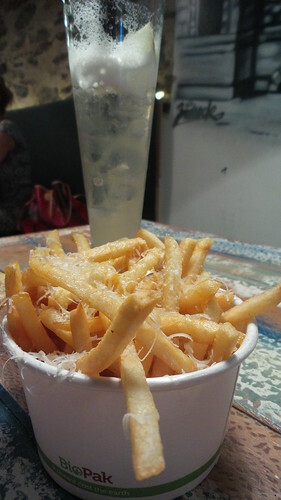 However, as far as I was concerned the stand out was the chips with parmesan and truffle oil. Too often chips and cheese is more ‘chips drowning in cheese’ whereas these chips (shoestring fries really) were topped with a judicious grating of cheese and had just the right hint of truffle from the oil. I know that truffle oil bashing can be a bit of a thing, but in this case it lent just the right amount of complementary earthiness to the potatoes. Burger prices hover around $13 (chips not included) or you can opt for a tasting board of sliders (3 or 6) and there’s a selection of sides which fit in with the American burger theme. The cocktails are mostly $18 but there is also a selection of beers (both on top and bottled) and the short wine list is to be commended for its interesting local focus – particularly in that it includes an Adelaide Hills Sauvignon Blanc (from Sidewood Estate) rather than one from across the ditch. Based on the (re)launch The Taxpayer should do well, by providing something for everyone and combining it with a relaxed atmosphere. I will definitely return. * If you haven’t already, read through Matt Gilbertson’s guide to becoming an Adelaide A lister!